Lux Narayan on the TED stage. He is also a co-founder at ShareMyCake Charitable Foundation, a non-profit that focuses on raising more generous children. Before Unmetric, Narayan was a co-founder at Vembu Technologies, an online data backup company. On the show today, ideas about dying well and the lessons we can learn from those who have already died. LUX NARAYAN: I still remember an expression I heard when I was in my teenage years decades ago when someone said if you want to learn about man's failures, read the newspaper from the first page onwards. If you want to know about man's successes, read it from the last page. RAZ: This is Lux Narayan. NARAYAN: And those were days when the newspaper had just one section, and the obituaries were typically towards the end of the paper. And that's essentially what they meant. And I couldn't agree more because, you know, the kind of lives that are celebrated in the obituaries that are written about by an editorial team are typically lives well-led. RAZ: Ever since Lux was a teenager, he's been fascinated with the way people are memorialized in print. NARAYAN: It kind of paints a rich tapestry of the different kinds of things people do and are remembered for. And I think it's a very beautiful reminder of the kind of legacy people leave and how they made an impact and just the broad canvas that our world is, right? 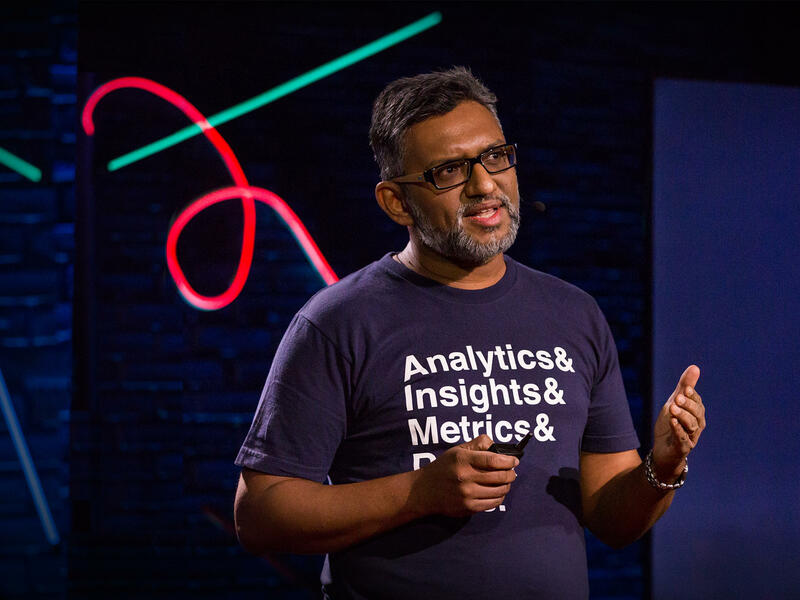 RAZ: Here's more from Lux Narayan on the TED stage. NARAYAN: I read the obituaries almost every day. My wife understandably thinks I'm rather morbid to begin my day with scrambled eggs and a - let's see who died today. NARAYAN: In my day job, I run a company that focuses on future insights that marketers can derive from past data, a kind of rearview mirror analysis. And we began to think, what if we held a rearview mirror to obituaries from The New York Times? Were there lessons on how you could get your obituary featured, even if you aren't around to enjoy it? NARAYAN: Talk about having to be patient. Of course, it varies by profession. If you're a sports star, you'll probably hit your stride in your 20s. And if you're in your 40s like me, you can join the fun world of politics. Politicians do their first and sometimes only commendable act in their mid-40s. RAZ: So in your talk, you have this beautiful, like, word chart, right? We've seen these before, where you've got, like, small, teeny-tiny words and big words to show which words showed up the most in these obituaries. And amazingly (laughter), when you show this on screen, there's one word that stands out above all others. And it's help. NARAYAN: It's beautiful, isn't it? NARAYAN: I was fascinated when I saw that word because when you're analyzing 2,000 paragraphs of text, you wouldn't expect one or two words to stick out and stand out as prominently as this did. And what we found fascinating when we went through some of those descriptors was the fact that the help took on different contexts. For example, Reverend Rick Curry, who, you know, helped veterans and disabled people by running writing and acting workshops. There's Jocelyn Cooper (ph), who was a grassroots organizer in Brooklyn in the 1960s. And she helped pave the way for the first African-American woman to sit in the U.S. Congress. There was someone who passed away a few weeks ago who helped create the character of Spider-Man. It's beautiful that, you know, the people who are remembered for things that they did helped do so many things in the most obvious sense of the word, in terms of helping people, but in some not so obvious context as well, in terms of helping a discovery, helping a creation or simply helping explain something. It was beautiful how that word stood out so strongly. RAZ: Having read all these obits and having sort of crunched the numbers and then - and just thinking about it, could you argue that, in some ways, we live our - a part of our lives or a big part of our lives in preparation for death? NARAYAN: I think we do. Even if we aren't directly thinking about it, there is certainly a part of us that is cognizant about the passage of time, about the fact that there is less time to do some of those things that we set out to do. And you see that in different ways. You see people crossing a certain age or a certain point in life. And they say, OK, I want to actually do those things that I promised I would do 20 years ago. And all of that, even if not articulated in the context of death, is rooted in, in some way, realizing the passage of time and therefore preparing for a time when we're not going to be around. NARAYAN: We uncovered many lessons from lives well-led. And what those people immortalized in print could teach us - the exercise was a fascinating testament to the kaleidoscope that is life. And even more fascinating was the fact that the overwhelming majority of obituaries featured people famous and nonfamous who did seemingly extraordinary things. They made a positive dent in the fabric of life. They helped. So ask yourselves as you go about your daily lives, how am I using my talents to help society? Because the most powerful lesson here is if more people lived their lives trying to be famous in death, the world would be a much better place. Thank you. NARAYAN: Lux Narayan. He runs a social media analysis company called Unmetric. You can find his full talk at ted.com. FRANK SINATRA: (Singing) I'm gonna live 'til I die. I'm gonna laugh 'stead of cry. I'm gonna take the town and turn it upside down. I'm gonna live, live, live until I die. RAZ: Hey, thanks for listening to our episode on Dying Well this week. If you want to find out more about who was on it, you can go to ted.npr.org. And to see hundreds more TED Talks, check out the TED app or ted.com. Our production staff at NPR includes Jeff Rogers, Sanaz Meshkinpour, Janae West (ph), Neva Grant, Rund Abdelfatah, Casey Herman, Rachel Faulkner and Diba Mohtasham, with help from Daniel Shukin (ph) and Megan Schellong. Our partners at TED are Chris Anderson, Colin Helms, Anna Phelan and Janet Lee. I'm Guy Raz, and you've been listening to ideas worth spreading right here on the TED Radio Hour from NPR. SINATRA: (Singing) Live, live, live, live until I die. Transcript provided by NPR, Copyright NPR.